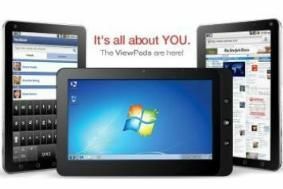 CES 2011: ViewSonic launches ViewPad 4 and ViewPad 10s tablets | What Hi-Fi? The ViewPad 10s and the ViewPad 4 are Android-powered devices with, you guessed it, 10.1in and 4.1in screens respectively, the latter being more smartphone than tablet. The 10s uses the Android 2.2 operating software, outputs native 1080p video via an HDMI connection and has a 1.3-megapixel video camera. The ViewPad 10s has a 1024 x 600, backlit LED screen. The capacative screen supports multi-touch control, too. You'll also find 3G, GPS, Wi-Fi and Bluetooth 2.1+EDR built-in to the device. There are plans for a non-3G model, too. The smaller sibling, the ViewPad 4, supports Wi-Fi, 720p video and GPS, plus has an 800 x 480 resolution screen. Billed as a tablet, it looks more like a smartphone to us, and sports a 5.1-megapixel camera also allows for 720p HD video recording as well as video calling. Prices and release dates to follow but they're expected to be out in Europe this Spring alongside the ViewPad 7 announced at the end of last year.